Here is a detail of the painting. Keep your colors moist, yet strong. 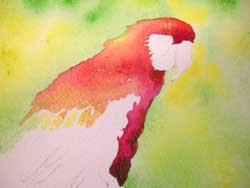 Where you have painted wet onto dry paper you will have a crisp edge. Where you have painted wet pigment into wet, the colors will mingle and diffuse into one another. The more wet, the more diluted the colors will be. If you are adding color to a very wet area, your paint needs to be less wet, almost straight out of the tube (with just a little water). Don't worry about fussing with this glaze of color. Remember this is an under painting or base coat. The shadows and details will be added at a later stage.